The first disease that we are tackling through this innovate approach is chronic pancreatitis, a painful and costly disease that is a risk factor for pancreatic cancer. There is no treatment, but there is a group of researchers and clinicians at top medical centers around the world who are committed to collaborating to discover ways to prevent and treat the disease. Pancreatitis patients and their families stand ready to participate in therapy development and the National Pancreas Foundation is providing support. Chronic pancreatitis is inflammation of the pancreas, the organ that produces digestive enzymes and insulin. The inflammation leads to scarring, which causes severe digestive problems and, eventually, diabetes. 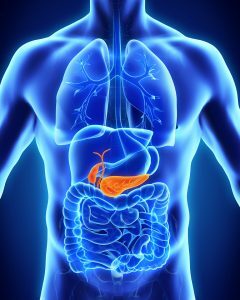 Chronic pancreatitis patients experience extreme pain and are at exceptionally high risk for pancreatic cancer. Chronic pancreatitis affects about 150,000 Americans and over a million people worldwide. Chronic pancreatitis affects children and adults. Unfortunately, for people suffering from chronic pancreatitis, there is no treatment. The only hope for some patients is removal of the pancreas in a total pancreatectomy, major surgery with significant risks and side effects. Chronic pancreatitis can be caused by a genetic defect, a physical injury to the pancreas, gallstones or other blockages, or medications. Alcohol and smoking can contribute to chronic pancreatitis. For a significant proportion of chronic pancreatitis patients the cause is unknown. Many chronic pancreatitis patients first experience acute pancreatitis, a temporary inflammation of the pancreas that is very painful and can be deadly. Acute pancreatitis was the most common principal gastrointestinal diagnosis for hospital admissions in the US, costing over $2.6 billion in inpatient costs in 2007 alone¹. Approximately 10-15% of people who suffer acute pancreatitis episodes develop chronic pancreatitis. 1 Burden of Gastrointestinal Disease in the United States: 2012 Update, Gastroenterology. 2012 November ; 143(5): 1179–1187.e3. doi:10.1053/j.gastro.2012.08.002.